¼ cup Dry White Wine. If you do not have Juniper Berries, you can try whole Allspice as an alternative. The wine can be omitted in favor of extra stock and, if desired (and you have the space in your pot, you could add some thickly sliced sausage along with the ribs. 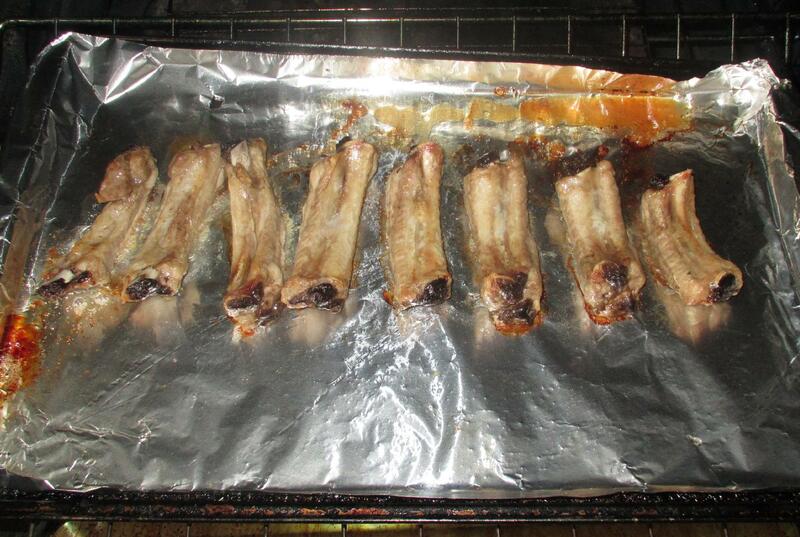 First, brown your ribs either by frying or by giving them 10 or 15 minutes in a 400 degree oven. This step is optional, but the browning will add nice flavor. 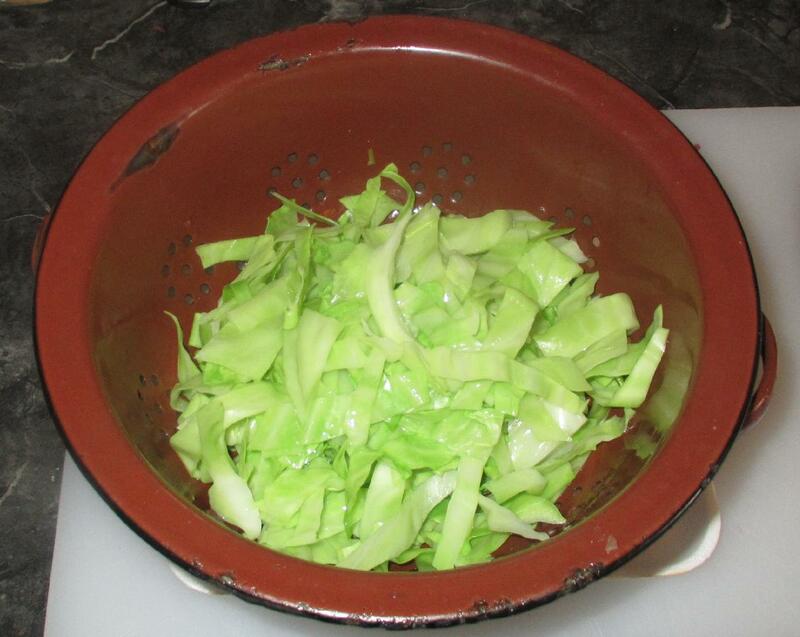 Blanching the cabbage, by immersing for 30 seconds in boiling salted water for 10 seconds and then refreshing in ice-cold water, will help it to maintain its color somewhat during the main cooking process. Again, you can omit this step, if desired. Next, sauté the bacon until it is browned (but not crispy). 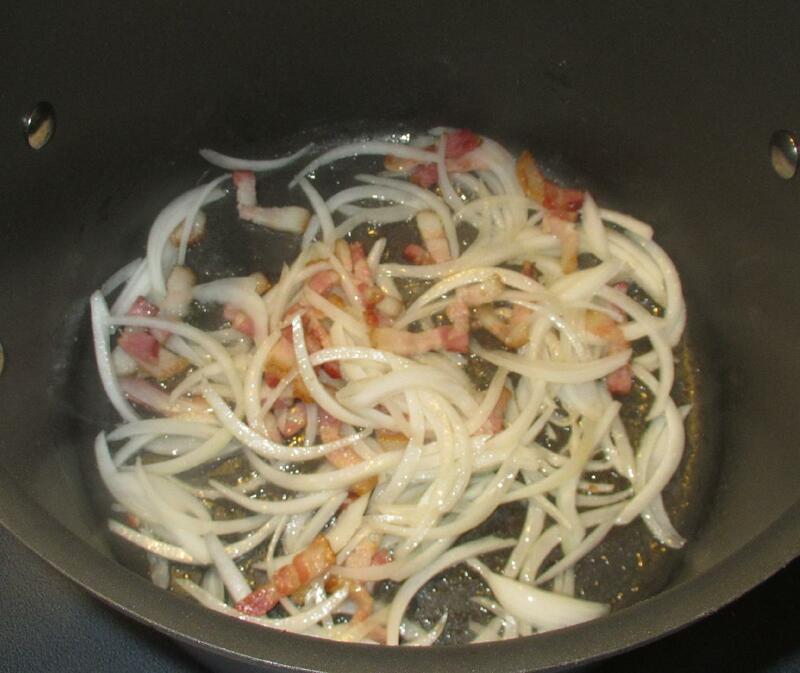 Add the sliced onion and as soon as it is translucent, remove your pan from the heat. 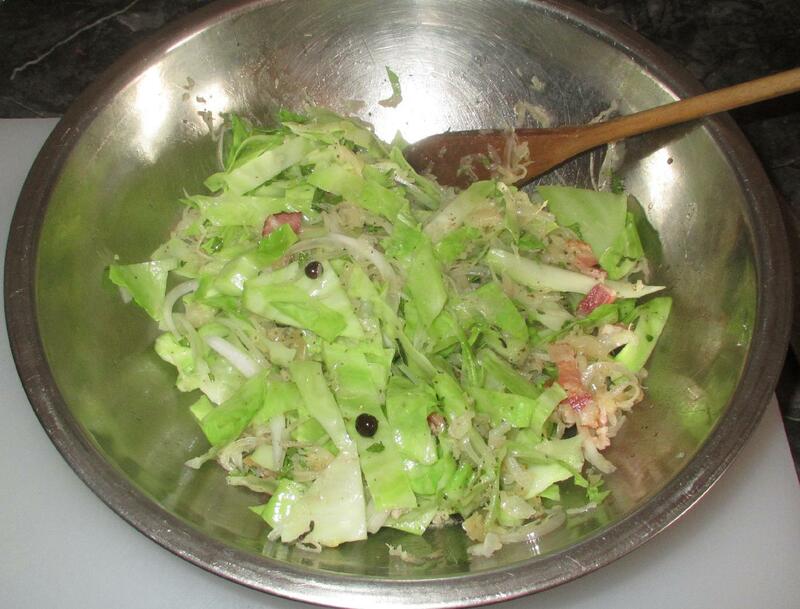 Mix the onion and bacon together with the cabbage and sauerkraut and then stir in the herbs and seasonings (other than the bay leaves) and any needed salt. At this point, you can store the mix in the fridge until needed. To be honest, I was a little disappointed with the result here. My wife enjoyed and I thought it tasted okay but, ultimately, it was not quite as good as other similar dishes I have made. 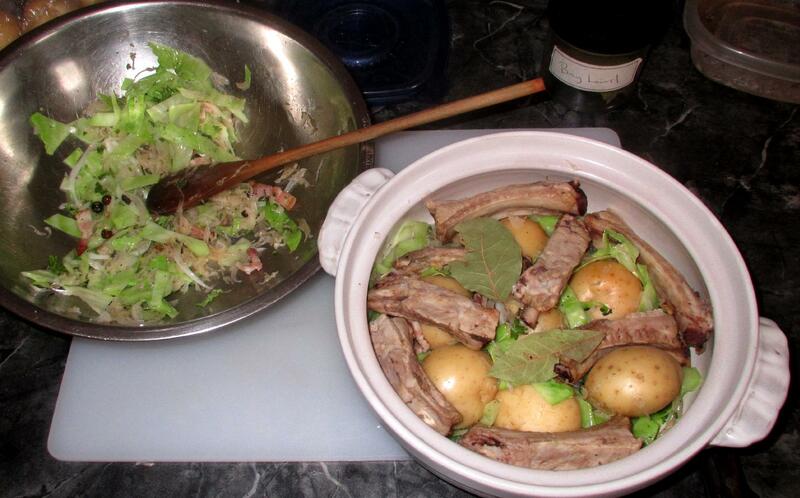 In the first place, it really needed more meat and, secondly, the combination of sage and celery seed did not work as well as it has done when I also included some apple along with the cabbage and pork. 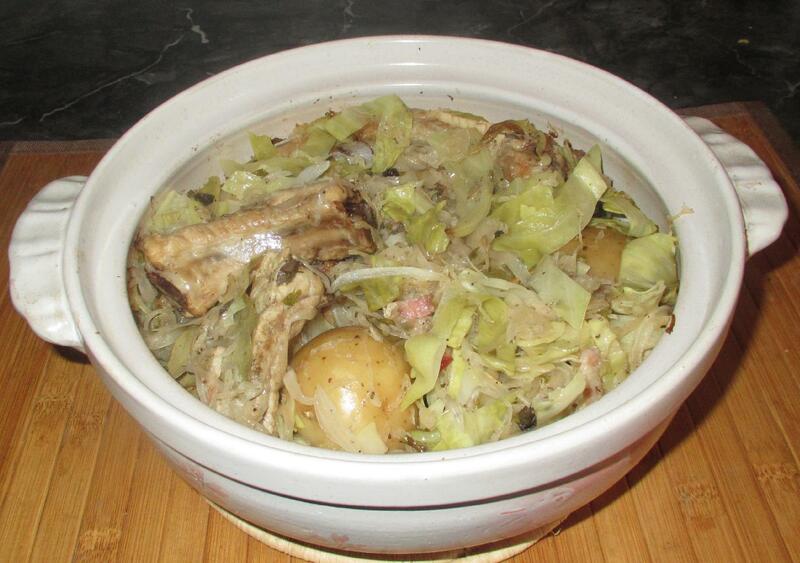 I really like the idea of an ‘Alsatian Hotpot’, but this dish needs quite a bit of work yet. Interesting to have this on your ‘bucket list’. It’s not on mine, but perhaps I’m missing out because I have been to Alsace but have never tried this. I really admire the honest appraisal of the dishes you do. I tend to ‘talk it up’ for the sake of my ego.